Super Rugby may have produced some of the most entertaining and enjoyable action in the game's history but the ugly on- and off-field, incidents which have sometimes garnered the greater attention. The competition has certainly help forge the careers of some modern-day greats while others will go down in history with slightly less desirable reputations. 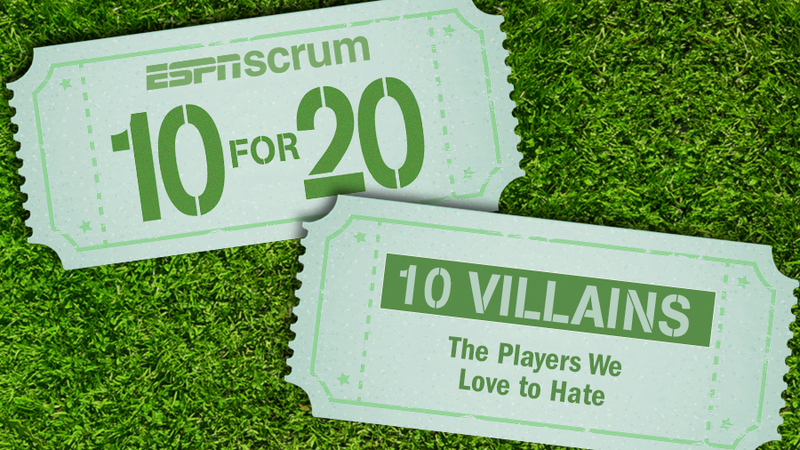 From suspensions and off-field indiscretions, through to the players opposition fans just love to hate, join us as we continue our 10For20 series with Super Rugby's top 10 villains. He may have returned home to Queensland in search of Super Rugby redemption but James O'Connor shouldn't expect a warm welcome when the Reds travel to Perth or Melbourne. O'Connor didn't really endear himself to fans of the Force or Rebels. Remember the infamous "Brand O'Connor" interview? The veteran Crusaders No.7 is in no way a dirty player but his ability to avoid the wrath of referees, and frustrate opposing fans, sees him find a spot on this list - in Australia and South Africa anyway - more in a "pest" mould rather than a true villain. Regarded as one of the hardest players in world rugby, Burger has often found himself on the wrong side of rugby's laws. The Stormers back-rower has battled injury and illness in recent seasons but a lengthy suspension rap sheet means he's sure to earn a mixed reception when he returns from Japan in 2015. The dual international's stint in rugby was never short on headlines but it was his inglorious exit from the 15-man game for which he is best remembered. Sailor tested positive to cocaine midway through the 2006 Super 14 season and never played professional rugby again. It may have eventuated through the baiting of Richie McCaw at Test level but the World Cup booing of Cooper from 2011 hasn't really slowed across the Tasman in Super Rugby. Kiwi fans love to taunt the Reds No.10, particularly when he lines up a shot at goal. Somewhat of a serial offender in Super Rugby, Nonu has seemingly sometimes confused the southern hemisphere's toughest provincial competition with rugby league; such has been his liberal use of the shoulder charge. One of the great villains in Super Rugby, former Waratahs centre Carter was a constant target of grandstand abuse and opposition niggle. Carter appeared to thrive on the attention however, and loved to further irk fans with his "get-out-of-my-grill" try celebration. Can't remember Tipoki? A hard-running, and tackling, centre for the Blues in the Super 12 days, Tipoki earned a 16-week ban for a nasty forearm that left Western Force fly-half James Hilgendorf with a broken eye-socket. Ouch. Among the most feared forwards in the history of the game, Botha's best - or rather worst - work was usually saved for the Test arena. He did find time to test the boundaries in Super Rugby however; just ask Phil Waugh or Gio Aplon. Renowned throughout world rugby for a tackling style that seldom involves arms, James is all too familiar with the SANZAR judiciary process. Coat-hangers, flying body-checks and the Aussie Rules styled hip-and-shoulder were some of South African's signature shots.